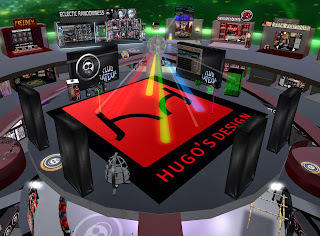 Latexia Space Station, home of the Latex Dolls, sports a nice new dance floor and is getting ready to receive Hugo party hosts for a classic Hugo-sponsored Best in Latex party! There haven’t been any events at Latexia in a while, so we’re happy to see the Dolls getting back in action. The party begins Saturday November 30th at 11AM SL time, which works out to 8PM for Europe - you have to guess that most heavy rubber fans are from Over There. Go, dance, meet the Dolls, wear your best latex, and have fun!